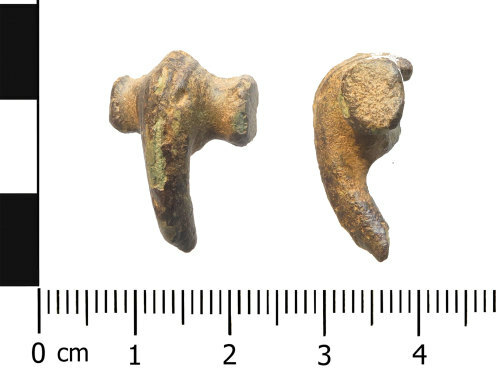 Roman brooch of Colchester derivative, Polden Hill (Mackreth 2011, Part 3, Group 3, Plate 46, AD c. 50-400). The copper alloy brooch has semi-cylindrical wings which terminate with incomplete perforated wing caps. The wing caps are expanded in diameter compared to the wings. The axis bar, spring and pin are missing. At the centre of the upper edge of the wings/bow head there is a trace of a hook. The bowhead is hump-like in profile with a central ridge with a more shallow ridge either side. The head has a moulding on either side. The bow is oval in section and tapers to a broken, blunt point at the approximate mid-point. The break is not recent. The surface of the brooch has an incomplete brown patina. It measures 21.93mm in length, 15.58mm in width, and weighs 5.25g. The brooch is a Polden Hill type, Bayley and Butcher (2004:160) comment that the distribution of Polden Hill brooches are concentrated in the West Midlands. Mackreth classifies this type as Group 3 dating to AD c. 50 to c. 400. It is similar to Mackreth, Plate 46, No. 1854.